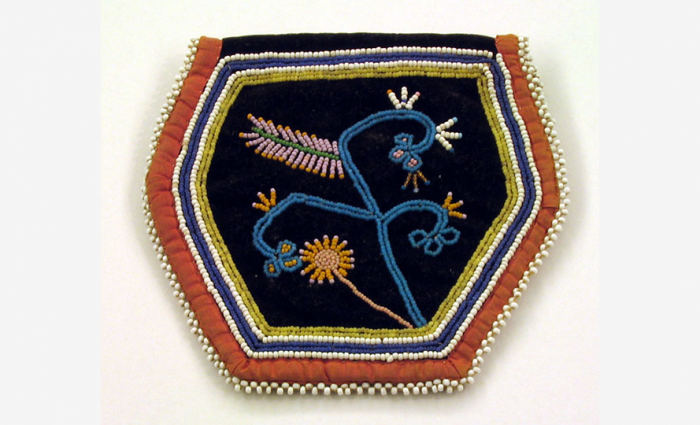 Made by Iroquois women, beaded bags were created from scraps of cloth, silk ribbon, thread, and glass beads. Traditional Iroquois patterns were replaced by European designs, such as flowers, in the 1840’s to appeal to customers. Seneca Bag, 1840-1860, black velvet, silk binding, glass beads, glazed cotton lining, H: 4 1/4 x W: 4 1/2 in. Fenimore Art Museum, Cooperstown, New York, Gift of Eugene V. and Clare E. Thaw, Thaw Collection, T0683.